This is sixth lesson of WordPress tutorial for Beginners series. In this lesson we will discuss about Media , Comments , Users and Tools menu options of your WordPress Dashboard. In case you missed the previous lesson on Settings option of WordPress dashboard then you can read below lesson. Media like Images, Videos and Audio form important part of any website. We have seen how to add media to your posts in lesson 4 of this series. WordPress has separate option for complete media management of your website. Library Option shows you all the images, video, files and other things you have uploaded in WordPress. You can add media from here as well using New option. Later while writing post or page you can select the media. You can also view which media you have attached to which post. All you need to do is click the media.You will see a pop up with below information as well as media itself. Just look to Uploaded to at bottom of page (as shown in below image). The link next to it is of page where you added the media. Comments make your blog interactive. It is used for conversation between you and your visitors. We have discussed Comments settings in previous lesson. In this lesson we will see comments management like approving new comments, deleting comments and filtering out SPAM comments. 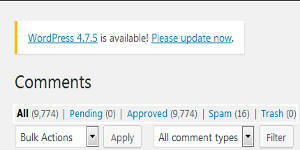 On your WordPress Dashboard click on Comments option. You will see page with comments and above menu options. You can reply to comments of visitors from this page. Spam comments are comments made by bots or bad people. They are not good comments for your site. You should delete them. It is good to keep your Spam comment and Trash comment count less. These comments take your database space and slows down website. So better get rid of them weekly or so. Below operations are available for a comment as shown in below image. Unapprove – The comment will be deleted. Reply – You can reply to the comment. Your response will be shown on page. Quick Edit – You can edit the comment. Spam – The comment is marked as SPAM. Trash – Delete the comment. WordPress Users option helps you manage Users of your WordPress installation. You can add users, delete users and control their access. If you are sole writer on the site then these options are meaningless. But if there are multiple users then these options are very helpful. 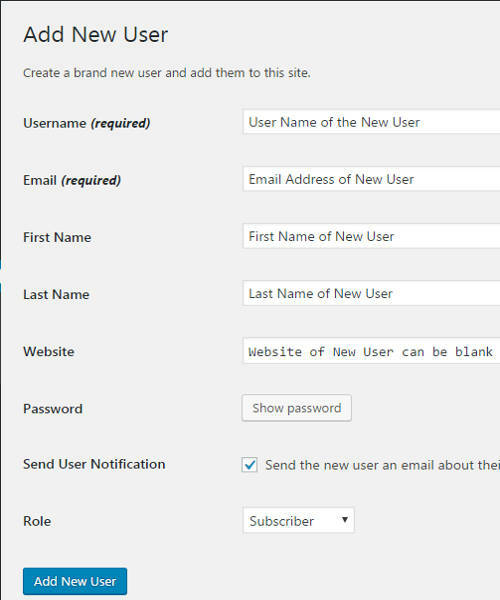 To add new user to WordPress site you can go to sub option Add New under Users option. You will see page as shown below. Once you click on Add New User a new user will be created. A mail will also be send to the new user. The person can now set the password and login to your site. The Role option is very important. It controls the access user will have on your website. In case you need to refresh the permission different roles have you can revisit the previous chapter. That chapter discussed exclusively about roles and their access. The Your Profile option under Users help you manage your own profile. This page also has very important option for securing your website. Though many of us do not use this simple option. 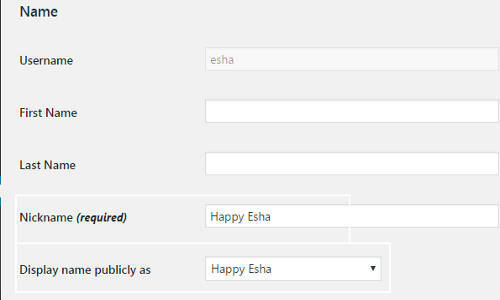 WordPress has concept of User Name and Nick Name. You use your User Name to log into WordPress website. For additional security it is important not to show your User Name. If person trying to enter your website does not know your user name and password then it becomes difficult to enter into it. 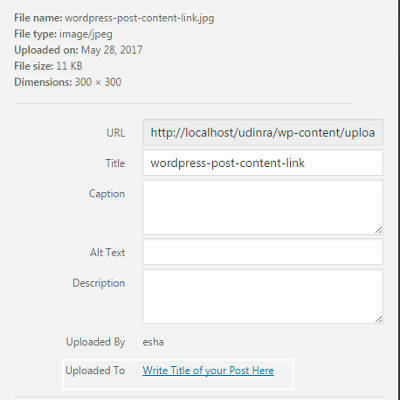 By default WordPress shows User Name of yours as author of a post or page. Ideally you should hide this user name from public. For this purpose WordPress has the option of Nick Name. You can not change your User Name from front end. So on this page change your Nick Name. Also in display name publicly as select your Nick Name. It is good to have entirely different NIck Name and User Name. I recommend changing Nick Name on all WordPress installation of Live website.It is simplest and most ignored of security options in your hand. The simple setting will help you fortify your installation. Tools option help you import and export content to and from WordPress. These options are very powerful yet simple to use. The import option is present under Tools menu. This page helps you copy content from other blogging platforms to WordPress.It allows you to import your post from sites like Blogger , LiveJournal , Movable Type and TypePad , Tumblr and WordPress. WordPress option is provided in case you want to import from other WordPress installation or you WordPress.com website. I am not covering this option in details. The reason is each of the option is detailed. It is not applicable for every one . One more interesting option is Category to Tag converter.It is good to know about this option. You may need to turn a tag into category if too many posts are clubbed under that tag. In those cases you can use this option. Export option helps you take backup of your WordPress articles. It is good practice to take regular backup of your sites. You can then restore your website if it is hacked. You can use import option discussed above to restore your site. It is good to select All content always. It backup everything posts and pages and other content if any. Later you can upload this XML file using WordPress Import.I would recommend taking Export weekly.It that is not possible you should take monthly backup. If anything goes wrong you can use this file to restore content of your website. It is said that best way to beat a hacker is to have backup of your site. You can quickly take down your site, delete the content and then restore the content. If you do not have backup then you are lost. So far we have covered most menu options and features of WordPress. These are core features of the framework. Now we will see features which make WordPress powerful and leader in market today. We will discuss about Plugins and Themes in next two lessons.